조선시대 만들어진 두 면이 납작한 높이 20.5㎝, 아가리 지름 5.0㎝, 밑지름 8.3㎝인 편병이다. 이 병은 물레로 둥글게 만든 다음 앞·뒤를 두들겨 평평하게 만든 것으로, 몸통이 풍만하며 비교적 두껍게 백토를 발랐다. 문양을 보면 아가리 주위에는 연꽃무늬로 띠를 둘렀고, 몸통의 앞·뒤 평평한 면에는 연꽃을 표현하였고, 좌우에는 풀을 새겨 넣었다. 엷은 녹색의 유약이 전면에 고르게 잘 녹아들어 투명하며, 굽이 높고 밖으로 약간 벌어져 안정감을 준다. 조선시대 작품으로 풍부한 양감과 문양이 잘 어울리는 중요한 자료이다. 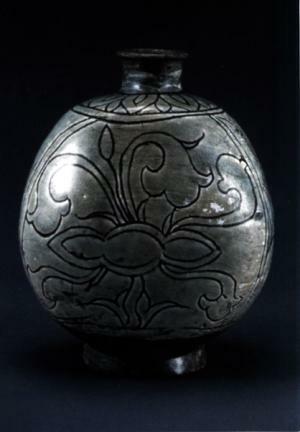 This bottle with a flatten front and back was made during the Joseon Dynasty and stands 20.5cm tall with a mouth diameter of 5.0㎝ and bottom diameter of 8.3㎝. The bottle was first shaped into a round form with the aid of a pottery wheel, and then was paddled flat on the front and back. The body is voluminous and coated with a thick layer of white slip. The bottle is ringed, around the mouth, with a band of lotus florets, and the flat front and back are also adorned with lotus design. 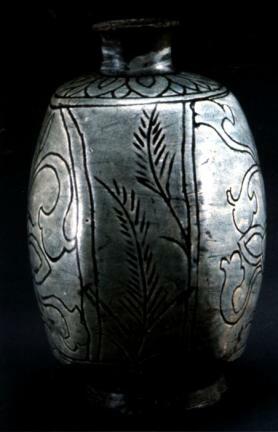 The left and right sides are embellished with a grass design. The surface evenly coated with a light green glaze is smooth and clear. The high foot has a slight outward flared rim, giving the bottle the impression of stability. This Joseon Dynasty buncheong bottle is a fine piece of ceramic art whose elegant underglaze decorations beautifully enhance its voluminous shape.